VMware has today released a great new tool that I think is a must have for all vSphere environments (4.1 and above). 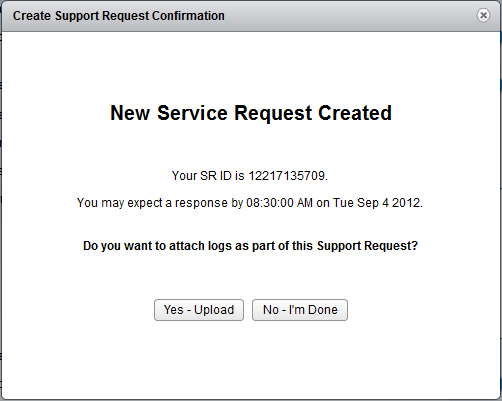 VMware vCenter Support Assistant allows you to create a VMware Support Request with Global Support Services (GSS) and upload the logs and support bundle all from one place. This will save vSphere Admins a lot of time and effort and hopefully speed up problem resolution for you as well. Take a look at the sample image below and refer to the links to find out more. Duncan Epping has just published an article titled Awesome appliance, vCenter Support Assistant. I would recommend you check this out also. The image below is from Duncan’s article and the official announcement on the VMware TAM Blog (Open to all comers). How simple this makes life when creating support requests. Ryan Johnson has produced a great demo, overview, and all the technical details regarding vCenter Support Assistant in the official announcement on the VMware TAM Blog. I would strongly recommend you read his article – Introducing VMware vCenter™ Support Assistant™ 5.1. Then go download the plug-in. This post first appeared on the Long White Virtual Clouds blog at longwhiteclouds.com, by Michael Webster +. Copyright © 2013 – IT Solutions 2000 Ltd and Michael Webster +. All rights reserved. Not to be reproduced for commercial purposes without written permission.